Shortly after Jesse Harper was hired from Wabash College to become Notre Dame’s first full-time athletic director and head football coach in 1913, he started working on upgrading and expanding the school’s football schedule. He contacted major colleges across the country, seeking to add major opponents. 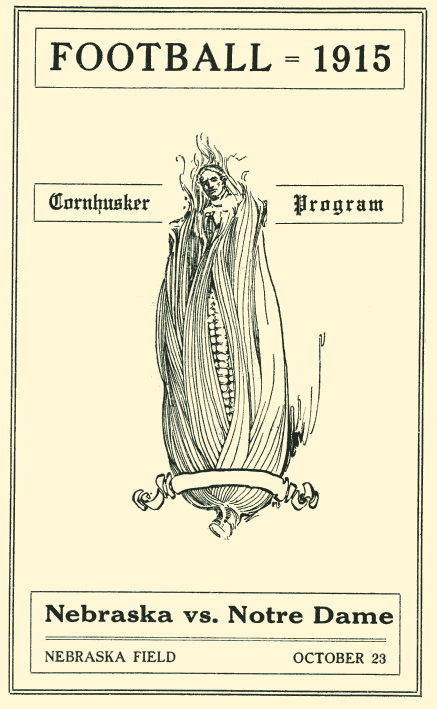 Harper’s efforts resulted in Notre Dame trips to play at Army, Penn State, and Texas in 1913; mighty Yale and Syracuse in 1914; and, in the third game of the 1915 season, a trip to Lincoln, Nebraska, to take on the Cornhuskers. Under head coach Ewald O. “Jumbo” Stiehm, the Huskers were perennial Missouri Valley Conference champions or co-champs. 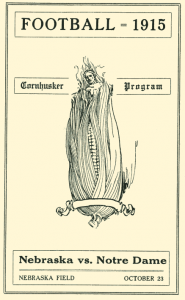 Since a 13-0 loss at Minnesota early in the 1912 season, Nebraska had not lost, and carried a 24-game unbeaten streak (23-0-1) heading into its October 23, 1915 game against Notre Dame. Harper’s ND squad was coming off a 6-2 mark in 1914, with one-sided losses at Yale and Army. Little was proven in the first two games of 1915, home victories over outmatched Alma College (32-0) and Haskell Indian Institute (34-0). The trip to Lincoln would be the team’s first major test of a season that would include return trips to Army and Texas. Back on the Notre Dame campus, students exhibited “old time pep” as they gathered in the dirt-floored Gymnasium to “see” the game recreated via telegraph wire reports. “Each good play was cheered and the player given nine ‘rahs’ just as if he were before the bleachers instead of hundreds of miles away,” the Notre Dame Scholastic reported. Oh, the wonders of modern technology. The report also noted “the open style of play which was brought to perfection by Notre Dame two years ago (in its initial upset of Army) was the means employed to defeat its inventors on Saturday. Nebraska completed five of eight pass attempts, including back-to-back fourth quarter completions of 18 and 35 yards, the latter a touchdown toss that broke a 13-13 tie and, with the extra point, put the Huskers ahead 20-13. In the frantic closing minutes, Notre Dame’s Jim Phelan intercepted a Nebraska pass and returned it to the Huskers 36-yard-line. Phelan then hit Stan Cofall with a pass to the 15. With time winding down, Cofall hit Arthur Bergman with a pass, and Bergman skirted left end for a 10-yard touchdown, his second of the game. Unfortunately, the extra point try failed, and Nebraska held on for a 20-19 win. Indeed, the strong showing at Lincoln did portend of good things to come. Harper’s men traveled to West Point and downed the Cadets, 7-0, and later concluded the season with a two-game trip to the Lone Star State, trouncing Texas, 36-7, and Rice, 55-2, with just one day of rest in between. Notre Dame finished the season 7-1. Nebraska, meanwhile, continued its winning ways, and finished a perfect 8-0 season by crushing Iowa, 52-7. For the season, Coach Stiehm’s squad outscored its opponents, 282-39. Take out the narrow victory over ND, Nebraska’s winning margin in its other seven games averaged 35 points. The Huskers would not suffer defeat until a 7-3 loss to Kansas late in the 1916 season, breaking a 34-game unbeaten streak. Notre Dame and Nebraska would go on to play each other every season through 1925. The 11-game series was as tight as that first meeting in 1915: each team scored five victories, with one game ending in a tie. The Huskers of 1922 and 1923 became the only team to defeat Notre Dame with the Four Horsemen in its backfield. And in 1924 at ND’s Cartier Field, the Fighting Irish would gain revenge with a 34-6 victory that would propel Coach Knute Rockne’s squad to its first consensus national championship. The role of the Nebraska-ND series — both on and off the football field — is detailed in both Coach For A Nation: The Life and Times of Knute Rockne and Loyal Sons: The Story of the Four Horsemen and Notre Dame Football’s 1924 National Champions.